By: amazing-mascots.com , custom mascot costumes and more! Now that pregame is over, it’s time to “tackle” the game. Since the baseball season is long, and games have no set time limit, it’s best to establish a schedule and develop a routine.The most useful thing to know before you go out are your entrance/exit points, the fastest ways to get around the stadium, and alternate break rooms. You may get stuck out somewhere during the game and need to take a quick break. Concession stands with freezers, storage closets, suites, bull pen lounges, “family” bathrooms, and offices are great escapes when you don’t have the time to get back to your dressing room. By knowing how to navigate your stadium you’re getting the maximum exposure with the minimum effort. Also it’s extremely important that you are comfortable with your dugout top and familiarize yourself with it’s dimensions. Falling off the dugout is a real danger and you, and the players below you, can get seriously injured. Check out the infamous clip of Wolfie falling off the dugout in Reno <click here> You should also watch out for the outfield walls, as they can be dangerous. Slider of the Cleveland Indians fell off the wall during the ALCS and torn his ACL. I fell off the outfield wall and broke my arm, requiring surgery to put a plate and four screws in my bone. Be aware of your surroundings! If possible give your mascot an introduction sometime after the first inning, mid 2 being an ideal time (the theory being that not everyone is in their seats yet during the 1st). You can announce the character, he/she makes his/her entrance, and does a quick skit, dance, or T-shirt launch. It’s a great way to let the crowd see the mascot and know that he’ll be around during the game. Check out Orbit of the Astros introduction <Click here> This was done pre game, but could easily be done in game. Mascots are often used to accentuate promotions. Work with your game director/promotional staff and determine which promos they mascot should be at and know when/where they are. One of the most common on field mascot promotions is the mascot race. Another is musical chairs. Normally I would budget 6 outs for a promotion. I would use 3 outs to get to position and be in position 3 outs prior. While you’re waiting for a promo, either interact with the crowd, or hide away in a tunnel/hallway. You should never be seen just standing idle clearly waiting for a contest. It makes you look like a bored intern in a costume. Skits are another great way to entertain the baseball crowd. There are many common skits, such as the Dance off, where the mascot attempts to get someone (planted player, umpire, fan, opposing mascot) to dance. The person is reluctant at first, but then breaks out into a dance, like this skit with Raymond and the Oriole Bird, the Greenville Drive game and the Eugene Emeralds. An easy skit is the “mascot streaker” where the character runs out “naked” and is pursued by security.For the “Slow Dance request” skit, the mascot finds a pretty lady who he wants to dance with, but has to argue with the sound guy to play the correct song. Watch Raymond perform this routine <click here>. 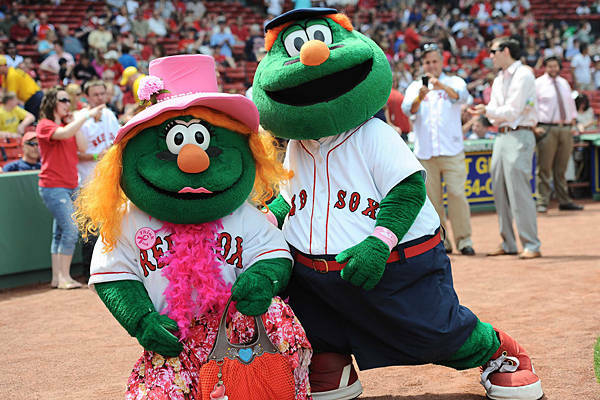 Another is the “mascot in drag” routine where the mascot puts on a dress and serenades an umpire or player. The Phanatic took it up a notch by dressing up as Lady Gaga and dancing. <click here> There is also the mimic/Monkey See Monkey do skit where a fan has to do what the mascot does. Check out Thunder from Lake Elsinore performing this <click here>. If your budget allows it, you can get real creative and create prop based skits, like Raymond’s tear away skit, which was adapted from a Famous Chicken bit <click here>. The grounds crew field drag is another opportunity to perform. Here Parker of the Fresno Grizzlies and his “Drag Kings” performing a dance to “Soulja Boy.” The “Mascot Evolution of Dance” is another popular routine, where the mascot dances to a variety of popular songs. Parker reworked the skit into the “Evolution of Hip Hop“. Watch YouTube and look at what other mascots do. Feel free to “borrow” the skits, as most mascot performers do. I suggest that you find some twist or unique way to make it your own. In the minors it’s easy to get time to perform, but in the majors where every inning break is sponsored and time is at a premium, it’s much harder to get time. One way to “sneak” skit time in is by piggy backing on a promotion. Here the Tampa Bay Rays mascot and the Texas Rangers mascot serve as contestants for the Pappa Johns “Dance for your dinner” promo <click here> A great place for “found time” are pitching changes. These breaks are usually not sponsored and offer time for the mascot to strut their stuff. Since pitching changes are random, it’s next to impossible to perform a live skit, so video skits are a better option. The 7th inning stretch usually features the mascot. The character hops on the dugout and pantomimes the stretch. After the stretch there is usually 60 seconds of “pump up” music. The Winston-Salem Dash dances to the song “Ice Cream and Cake.” You can also invite fans up to dance with you like the Phanatic does. The bane of anyone working in baseball is the dreaded rain delay. This is a good time to take a break, but it is also a great time to do some schtick. You can get a rain outfit for the character, but if your budget doesn’t allow for a custom costume, just go buy a large yellow poncho. It will fit over your mascot easily and people will “get it.” If you have an old/backup suit you can take it out and slide on the tarp or play in puddles. Be sure to check with your groundskeeper and supervisor before doing this. Mascot “Family” members are a great way to add entertainment to the game on Family Fundays (usually Sundays) and Mothers’/Fathers’ Day. Take your old costume or your backup costume and add accessories to make it into Mom, Dad, Grandpa, Or Grandma. For female family members a large dress, fancy hat, wig, lipstick/eyeshadow (made of felt and pinned on) and a purse work. For male characters a sports jacket, neck tie, tacky Hawaiian shirt, and a bushy mustache (fake fur fabric, pinned on) do the trick. For grandparents have the performer walk slower and perhaps give them a cane or walker. Many of these items can be found at a thrift store so you don’t have to break the bank to costume your characters. Mascot birthday parties are a popular event at baseball games, sometimes drawing large crowds. Invite local sports and sponsor mascots to the event. If you have a budget it’s even possible to bring in out of town mascots which is a special treat for the fans. Pregame is a good time to do a group introduction and skit. If you have time, film a video skit with the mascots to show during the game (or online) like the Raymond’s house party or the Mascot card video we did. Have the mascots available to do an autograph session. Having a poster made with all of the mascots on it is a great touch. If this is not in your budget, get the mascots to take a group photo before the game begins, print off color copies in the office, and have the characters sign the photo during the autograph session. If the team is down, consider a “rally” version of your character. 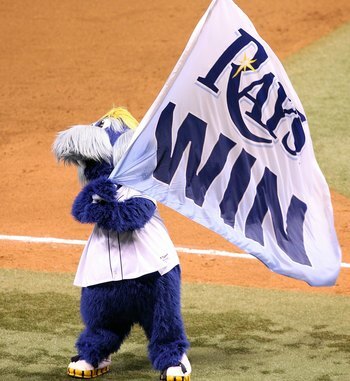 In Tampa we had “Rally Ray.” They played an intro video, cued the music, and Rally Ray came bounding out during the middle of the 9th. We created a super hero style costume for him to wear. “Rally Ray” when then pump up the crowd using his drum. If you have a Rally version of your character, pay attention to the game and make sure you take a break so you have some gas left in the tank. See where you’re at after the 7th inning stretch. If your team wins its great to “run the flag.” Get a custom flag made and run out to the field with it. It’s a nice way to end the game. If you have a “kids run the bases” post game it’s a nice opportunity to high five or take pictures on the field after the game. I was so wiped after working all game that I actually had my backup do it, which is advisable, unless you want to spend all day in costume. That’s all for now. Look forward to Part 3: Working the crowd. 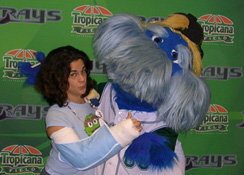 Kelly Frank has been designing and performing as professional sports mascots since 1998. She spent 5 seasons as "Raymond" of the Tampa Bay Rays (MLB) and parts of three seasons as "Thunderbug" for the Tampa Bay Lightning (NHL). She has also performed as a mascot for the WNBA, Major League Soccer, Arena Football, NCAA Basketball, and minor league baseball. She incorporated AMAZING!! Mascots, Inc in 2007 to provide unique, performer friendly, custom mascot costumes. "Stay fuzzy my friends." 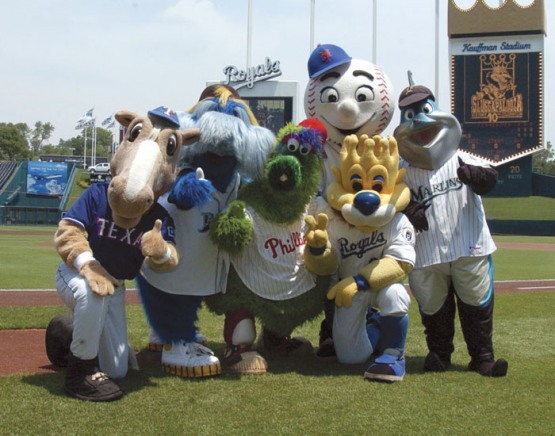 Posted on July 1, 2013, in amazing mascots, baseball mascots, bulldog mascot costume, costume ideas, costumed characters Chicago, custom costume, custom mascot costumes, eagle mascot costume, high school mascots, houston mascots, how to be a baseball mascot, how to be a mascot, how to clean mascot costume, how to find a mascot performer, how to perform as a mascot, how to wear mascot costume, mascot advice, mascot costumes, mascot costumes Chicago, mascot design, mascot performers, MLB mascots, professional mascot, school mascot, tiger mascot costume, wearing a mascot costume, what is a mascot and tagged amazing mascots, bulldog mascot costume, costumed characters, custom mascot costumes, eagle mascot costume, how to clean mascot costume, mascot costumes, mascot costumes Chicago, mascot tips, mascots, professional mascots, sports mascots, tiger mascot costume. Bookmark the permalink. Leave a comment. How much does your mascot head weigh? Some new #custom #mascot #shoes for a new corporate character debuting this week!